Growing up in Louisiana, sports was an outlet for most boys and as I started to take it more seriously I started to take my diet seriously as well. I used to buy potatoes by the bags and eat one daily before bed in an attempt to gain more weight (AKA “carb-loading”). I would only use the basics like salt, pepper and butter but once I got a taste of a twice baked potato filled with meats, cheese and whatever else you can think of, I was hooked. Check out my other recipe for a brisket version of my twice-baked potatoes. There are a lot of great duos that are legendary (like Michael Jordan and Scottie Pippen) and even peanut butter and jelly, but blending broccoli and cheese together doesn’t stray to far behind. I figured why not incorporate the same into a baked potato? So today I bring to you my Chicken Broccoli & Cheese Twice Baked Potatoes. What makes this recipe so great to me is the fact that you can eat the entire potato including the crispy skin. The Creole seasoned chicken breast chunks blend very well with the garlic-laced broccoli and cheese. And the end result is comfort cheesy goodness. Plus it’s gluten free! Sharp cheddar is a preference in my home, but any cheddar cheese will do just fine with this recipe. 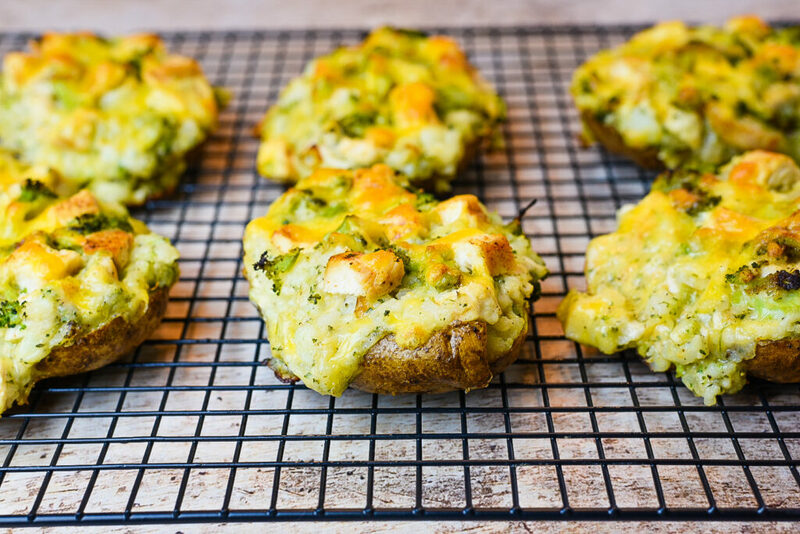 If you already love twice baked potatoes, then this Chicken Broccoli & Cheese version will fit perfectly into your dinner recipe rotation. Enjoy! Begin by poking holes with a fork into the potato then coating the skin with olive oil and sea salt. Cook potatoes on baking sheet for 1 hour then set to the side to cool when done. While the potatoes are baking, butterfly cut your chicken breast and season with Creole seasoning. Heat cooking pan to medium heat, add tbsp or more of cooking oil and cook the chicken for 4 minutes on each side. Set to the side when done. In a separate cooking pot, pre-heat to medium heat and add tbsp of cooking oil. Add onions, broccoli, 1/2 tsp sea salt, 1 tsp black pepper, and cook for 10 to 15 minutes covered. Remove from heat when done. 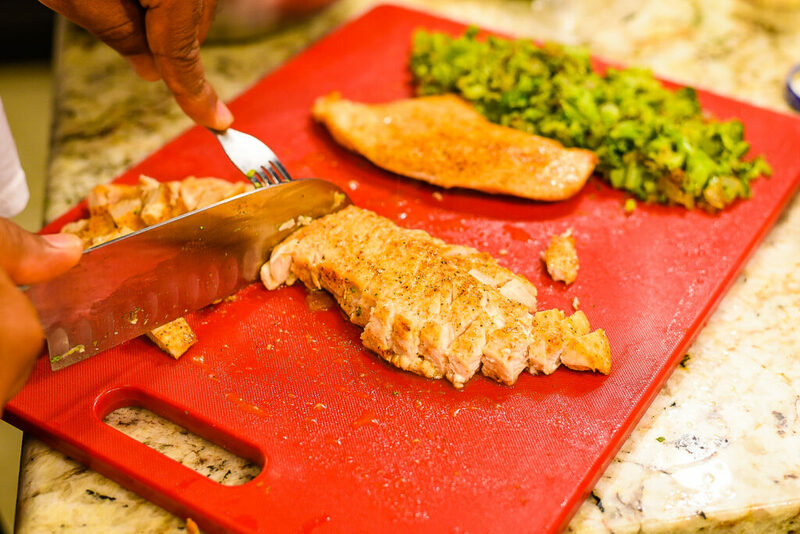 Chop the cooked chicken breast into small chunks and dice the broccoli and onion. Cut each of the cooked potatoes length-wise and scoop out the insides each potato with a large spoon and place insides in a large bowl. Add all of the remaining ingredients leaving the 1/2 cup of cheddar to the side. Mix all ingredients together until blended well and scoop ingredients back into the potato skins. Top off with remaining cheddar cheese and bake potatoes for another 15 minutes at 400 degrees. For crunchier broccoli, reduce the cooking time to 5-10 minutes. These look so yummy!! I could probably make an entire meal out of them. Wow, these look so tasty. 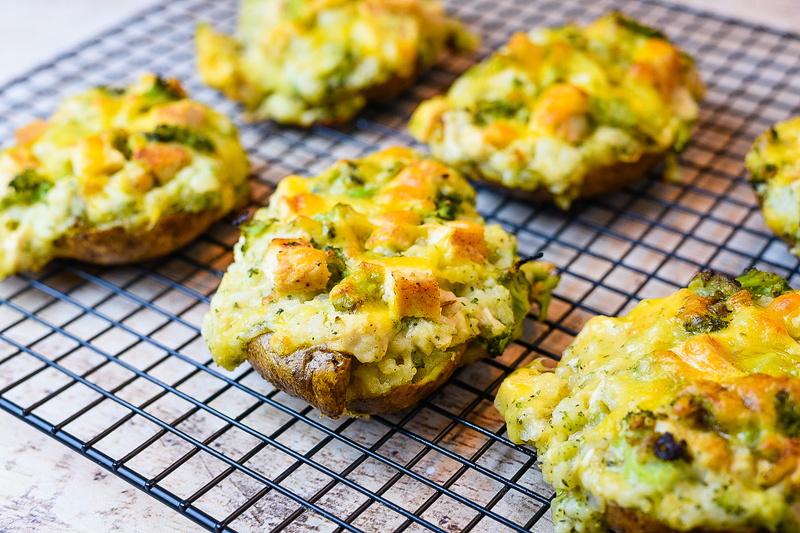 Chicken Broccoli & Cheese is always a winning combo and Twice Baked Potatoes are always twice as delicious. And I’m loving the in-progress photos as it shows how easy there are to make. I love that these potatoes can be a meal or a ridiculously delicious snack! 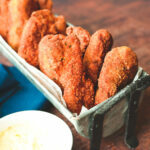 These are so flavorful and easy to prepare! The recipe sounds so delicious and flavorful. Chicken broccoli and cheese is one of my favorite combo. Yummy! 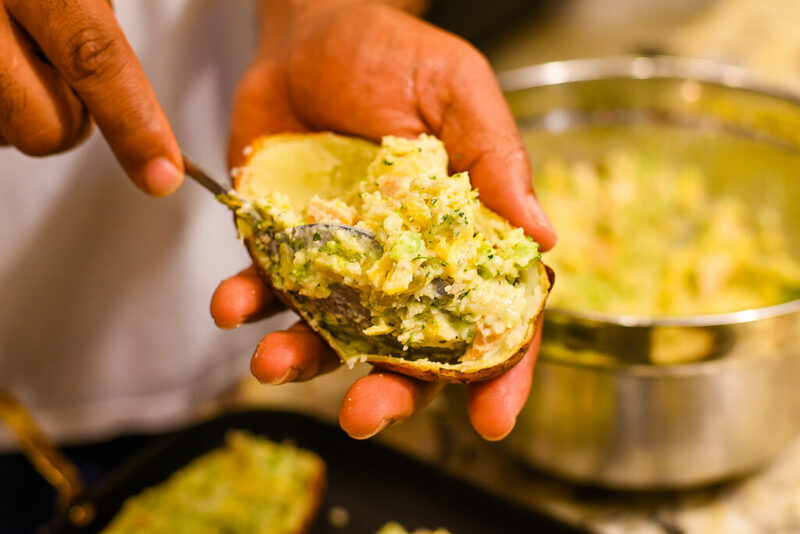 I’ve always liked twice baked potatoes – and I keep forgetting to make them myself! 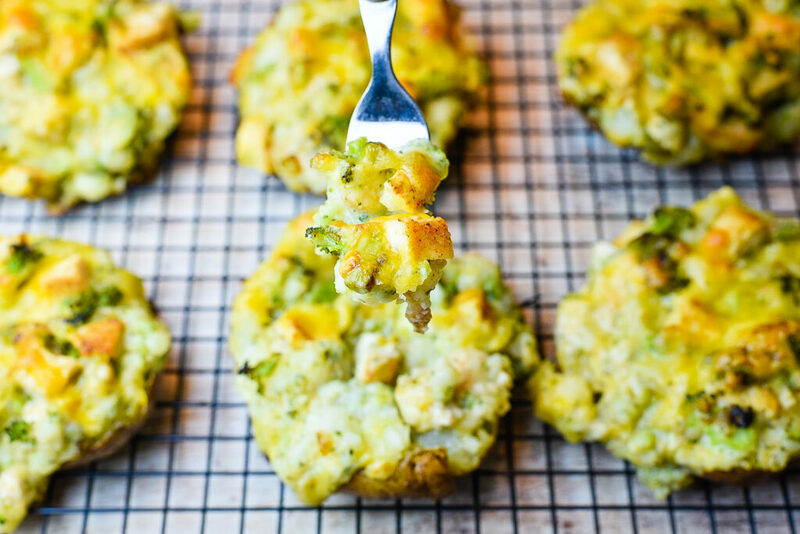 The addition of chicken to the more typical broccoli cheese potato is perfect – you know have the whole meal, there. Yes I think you would enjoy this one Elaina but butter is a must for me as well! These baked potatoes look amazing! A whole meal in loaded in these, I cannot wait to try this recipe out ASAP. Cool thanks Sharon! Please let me know how they come out. Back in the days when I woul eat fast food, Wendy’s broccoli cheese baked potatoes were one of my faves. Now I realize they were so basic. But these homemade twice baked potatoes are the real deal! Love it! Thanks Kitty! I used to eat the same thing at Wendys myself. 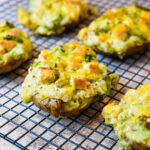 What a great way to turn twice baked potatoes into a complete meal! I love anything like this with the addition of extra veggies. I always struggle with side dishes to go with dinner! These are perfect! 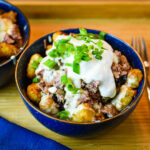 We love potatoes at our house and cheese is never a bad thing to have on anything! Cannot wait to try these! I think you would enjoy these Kelsey. Thanks! I would totally make these and a side salad. I’ve made these before but never with chicken. Thanks for the idea.